Passed away peacefully Wednesday 3rd April aged 78. Beloved wife of Carlo. Dearly loved mother and mother-in-law of Marietta and Victor, Kathleen and Nicholas, Daniela and Roger. 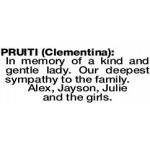 Grandmother of Dimitrie, Alessia, Christian, Alyssa, Sofia and Lucia. We cherished the happy memories. Now in God's loving care. 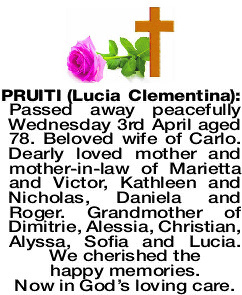 The Funeral Mass for Mrs Lucia Clementina Pruiti of Fremantle will be celebrated in St Patrick's Basilica, 47 Adelaide St Fremantle commencing at 2:00pm on THURSDAY (11.04.2019). The cortege will leave the church at the conclusion of Mass and arrive at the main entrance of FREMANTLE Cemetery, Carrington St, Palmyra at 3:45pm for a Burial Service. 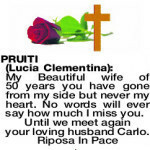 My Beautiful wife of 50 years you have gone from my side but never my heart. No words will ever say how much I miss you. A Wonderful Mother, Mother-in-law and Nonna. Who lovingly gave her all to us. We are grateful, and forever thankful for her love, and will cherish the beautiful memories. Forever in our hearts. Rest peacefully in God's Care. Maria, Victor, Dimitrie and Christian. Before you closed your eyes. RIP Kathleen, Nicholas and Alyssa. Thank you for all the cherished memories, words of wisdom and love. You taught us to always do what is right, be kind and help others. 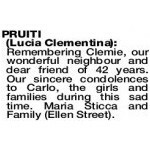 Goodbye to our darling Mum and Nonna. Forever in our hearts Rest In Peace in God's loving arms. Your daughter Daniela, Roger, Alessia, Sofia and Lucia. 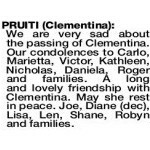 Fond memories of our cousin Clementina. 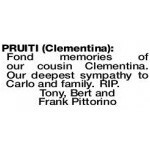 Our deepest sympathy to Carlo and family. RIP. 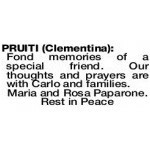 Fond memories of my dear cousin Clementina. 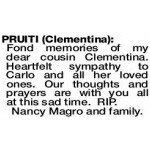 Heartfelt sympathy to Carlo and all her loved ones. Our thoughts and prayers are with you all at this sad time. RIP. 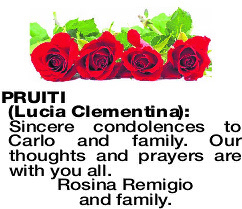 LUCIA CLEMENTINA Sincere condolences to Carlo and family. Our thoughts and prayers are with you all. Our thoughts are with you at this difficult time Carlo, Maria and Victor and family. 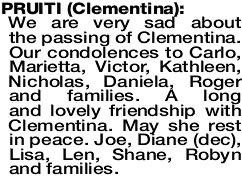 From Uncle Les and Aunty Dora and family. 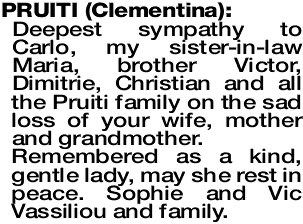 Deepest sympathy to Carlo, my sister-in-law Maria, brother Victor, Dimitrie, Christian and all the Pruiti family on the sad loss of your wife, mother and grandmother. Remembered as a kind, gentle lady, may she rest in peace. 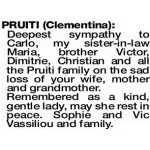 Sophie and Vic Vassiliou and family. 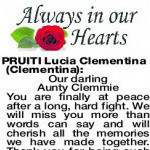 Our darling Aunty Clemmie You are finally at peace after a long, hard fight. We will miss you more than words can say and will cherish all the memories we have made together. 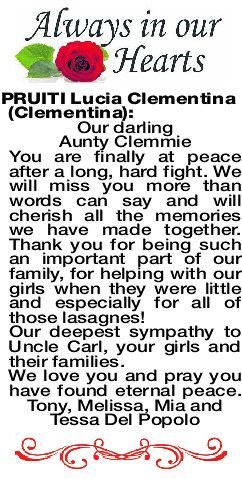 Thank you for being such an important part of our family, for helping with our girls when they were little and especially for all of those lasagnes! Our deepest sympathy to Uncle Carl, your girls and their families. 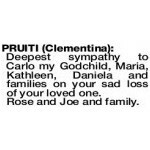 Deepest sympathy to Carlo my Godchild, Maria, Kathleen, Daniela and families on your sad loss of your loved one. Rose and Joe and family. 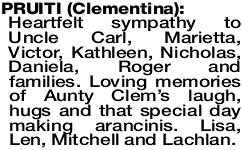 Heartfelt sympathy to Uncle Carl, Marietta, Victor, Kathleen, Nicholas, Daniela, Roger and families. 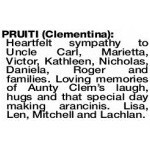 Loving memories of Aunty Clem's laugh, hugs and that special day making arancinis. Lisa, Len, Mitchell and Lachlan. 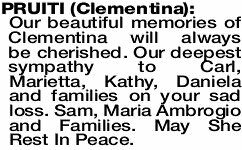 We are very sad about the passing of Clementina. 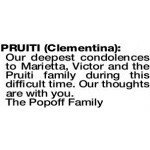 Our condolences to Carlo, Marietta, Victor, Kathleen, Nicholas, Daniela, Roger and families. 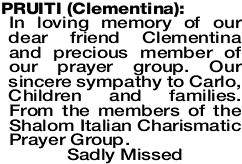 A long and lovely friendship with Clementina. May she rest in peace. Joe, Diane (dec), Lisa, Len, Shane, Robyn and families. 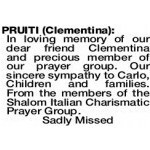 In loving memory of our dear friend Clementina and precious member of our prayer group. Our sincere sympathy to Carlo, Children and families. From the members of the Shalom Italian Charismatic Prayer Group. Fond memories of a special friend. Our thoughts and prayers are with Carlo and families. 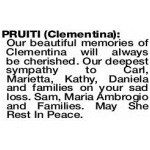 PRUITI CLEMENTINA Our beautiful memories of Clementina will always be cherished. Our deepest sympathy to Carl, Marietta, Kathy, Daniela and families on your sad loss. Sam, Maria Ambrogio and Families. May She Rest In Peace. 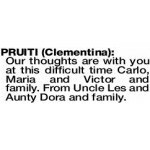 PRUITI CLEMENTINA Our deepest condolences to Marietta, Victor and the Pruiti family during this difficult time. Our thoughts are with you. 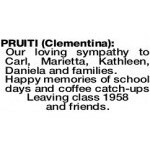 Our loving sympathy to Carl, Marietta, Kathleen, Daniela and families. Happy memories of school days and coffee catch-ups Leaving class 1958 and friends. In memory of a kind and gentle lady. Our deepest sympathy to the family. Alex, Jayson, Julie and the girls. 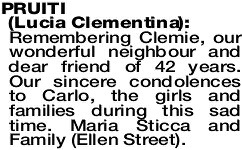 LUCIA CLEMENTINA Remembering Clemie, our wonderful neighbour and dear friend of 42 years. 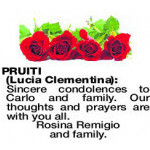 Our sincere condolences to Carlo, the girls and families during this sad time. Maria Sticca and Family (Ellen Street).